You'll be £12.99 closer to your next £10.00 credit when you purchase Norfolk Coast in the Great War. What's this? 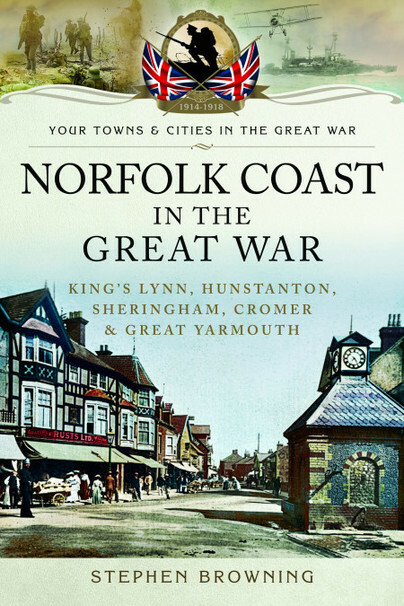 Norfolk Coast in the Great War focuses on the trials and joys, the achievements and disappointments, the humour and the sadness of every-day life in a region living on the edge of the country at the heart of the Kings vast Empire. Everyone from the folk who went off to fight, to scouts and schoolchildren, had a role to play in this coastline that had, since the time of the Spanish Armada, been considered a likely place for an enemy invasion. There were days of great tension, even terror, such as on the day of the first bombardment of the coast by the German Navy, and the day of Zeppelin attacks and dog fights out to sea when the flimsy planes of a fledgling RAF took on the Red Baron and his comrades. This unique study is based largely on original archive material, much of it never before published in book form. It is accompanied by many rare and fascinating photographs that show the day-to-day life of the people who lived in the many settlements on the coast and just inland. In addition, this book also gives an itinerary for a walk along the 46 mile stretch of the coast from Hunstanton to Cromer, taking in many of the places discussed and giving views that are exactly the same as they were 100 years ago. ★★★★★ A delightful book crammed full of pictures and insights. The Great War should have ended all wars. Stephen Browning yet again has researched heavily bringing to life what life would have been like in Norfolk during those years. Whilst it centres on the Norfolk coast no historical library would be complete without its presence. An excellent read. Altogether this is a fascinating book which has resulted from endless hours of research, research and yet even more research. The final result is well worth all that effort and provides an extra chapter to the history of this corner of Norfolk to add to that which we thought we already knew. The publisher produces a number of fine series that provide valuable insights into history. The sad part of reviewing books is that time restricts the number of books that can be read and reviewed. As a result, the FIRE Project review team has not been able to review all of the titles in the local histories of WWI, taking only snapshots of the series. This new title is a delight and representative of the high standard achieved by the series. The text is built on thorough research and is very ably supported by a host of illustration – Very Highly Recommended. Stephen Browning has written a series of books with Norfolk themes. Titles include Discover Norwich, Discover Norfolk – Land of Wide Skies, Spirit of Norwich Cathedral, Norfolk Food Heroes and Peddars Way and the Norfolk Coast Path. He has also written The World of Charles Dickens. In Asia he has written several books aimed at helping young professionals with their English skills, two which have won top awards in Taiwan. Time permitting, he also enjoys writing features for Norfolk magazines and newspapers as well as detective stories.